Beyond Salmon: A sharpener plus 2 great knives for $35! A sharpener plus 2 great knives for $35! Amazon.com is the answer to almost every kitchen equipment buying question I get in my classes. That and Cutleryandmore.com. I almost never set foot into a kitchen store these days. Sure, it might be a fun outing, and a good way to get rid of some disposable income, but when it comes to buying useful kitchen equipment, I find going to stores to be counter productive. 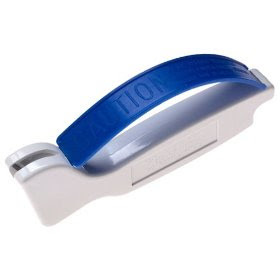 There is still one tool that I have been sending my students to the brick and mortar Tags hardware for -- Accusharp knife sharpener. It's only $10, but the shipping on it costs almost as much, and cutleryandmore.com that gives you free shipping on orders over $60 doesn't carry it. Well, Accusharp's day has finally come. It's now on Amazon (or maybe it's been there for a while and I just haven't noticed). It comes with free shipping if you spend $25. That shouldn't be hard. I am sure you could throw in some book or CD... Or how about an 8 inch Forschner Fibrox chef's knife and a 3 1/4 inch paring knife? Believe it or not, Amazon suggests those as "buy all three for $35" on the Accusharp page. That's collaborative filtering at its finest! Now I truly appreciate why Jason spent 7 years at MIT. Sure, some scientists try to cure cancer or explore space, but collaborative filtering helps people cook better, and as Brillat-Savarin said, "The discovery of a new dish does more for human happiness than the discovery of a new star." How do you use accusharp and maintain that lovely knife? Here is a piece I wrote for Culinate a few years ago that can answer your knife maintenance questions. Please ignore the picture of some person cutting celery with incorrect claw grip. It was not under my control. I promise. p.s. I just realized that the title of this post makes me sound like a pushy sales person. In case, you are wondering I am not affiliated with either Accusharp of Victorinox. They have never even offered me free goodies in exchange for a post. They don't need to. I love their products so much, I am happy to do all the cheerleading for free. Hi Helen! It's so nice to visit your blog again. $35 for two great knives and a sharpener is an excellent deal! All of my knives are terrible; I really should take your advice and head over to Amazon this week. If you ever get a chance to cut with a truly sharp blade, you may find you become addicted. These higher end steels not only require the kind of hand maintenance it can take a long while to master, but also cannot be used for quite the same wide range of tasks (chopping frozen foods, cutting through small bones and such like). However, some discover it as a second passion, and for a lover of fish you may just yet become addicted to unparalleled cutting action of a well sharpened yanagi. I completely agree with Tom, especially the addiction part, which is why you should not visit that forum. The Forschner's great! Really! I use Accusharp instead of a steal. Do you have suggestions for a boning knife and a cheese knife? I have a Henckels Twin Pro S 7-Inch Santoku Knife with Hollow (Granton) Edge that I love...should I stay within the same brand/line so the steel that I have for that works for these too? Thanks and happy holidays! The steel is not brand dependent -- it's just a hard straight stick :) so you can use any brand steel on any brand knife. I like Forschner fibrox boning knives (and all the other knives they make). I don't have a cheese knife, so can't comment.